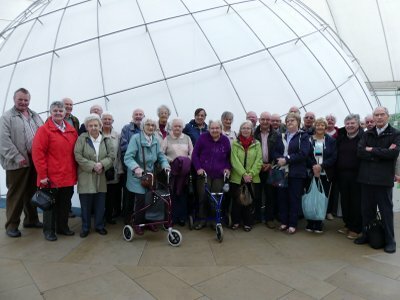 Sunshine and showers accompanied the 28 travellers on this year's Summer Outing to Dynamic Earth in Edinburgh, but our programme was largely indoors, so naebody got drookit. 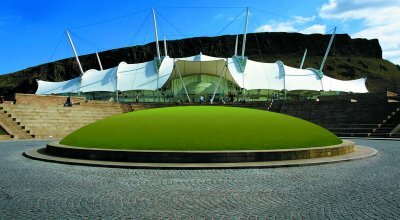 Dynamic Earth boasts a fascinating range of interactive exhibits designed to acquaint you with how the Earth was formed and has evolved. We started with the Big Bang and exploding stars across the galaxy, then saw the beginnings of life as hydrogen combusted to form other key elements like oxygen and carbon. Billions of years after its formation, tectonic forces are still shaping the planet, and the volcanoes and lava section allowed the Earth to move for everybody. Glaciers have moulded the surface of the Earth and some breathtaking aerial photography illustrated how. Life began in the oceans, and the numbers and variety of sea creatures opened our eyes. Touching the iceberg proved a popular pastime. The Hominid section traced the development of species from single cell life, through fish and reptilian forms to dinosaurs and the emergence of man through his chimpanzee roots. 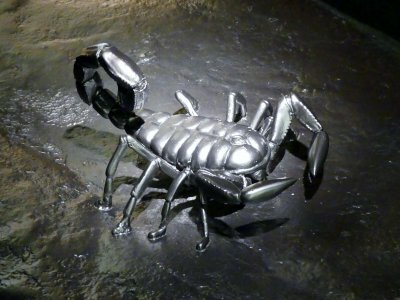 Many life forms were made extinct through natural disasters like meteorite showers, Ice Ages, volcanic eruptions and the like, but life always adapted and evolved to new conditions. A film tour of the landscapes from Arctic to Savannah demonstrated the diversity of habitats occupied by all the species, then the Rain Forest section gave us an inkling of the lush vegetation and tropical rainstorms around equatorial regions (somebody had seen wetter Thursdays in Luncarty, but no names...). The final element of the tour was held in the ShowDome Cinema where we watched a 360-degree film of how astronauts are trained to withstand the perils of space - micro-gravity, extremes of hot and cold, space debris, etc. - while carrying out research, exploration and maintenance work aboard their space stations and shuttle craft. After the tour concluded, the weather perked up and the party could choose between a cup of tea, or a stroll round Edinburgh's Royal Mile, the Scottish Parliament or Holyrood Palace and Park. The day concluded with a delicious spread in the Hideaway Restaurant, Halbeath, where president Jim Calderwood thanked proprietors Ian and Sheila, their very friendly waiting staff, the bus driver and all who attended for a great day out. Many thanks to Arthur and Jean Bruce who organised the excursion and provided most of the photographs.